Many cameras have a built-in microphone, as part of their default features. If you have ever tried to record audio through your camera’s build in microphone, however, you’ll have run into a few issues. We’ll run through a couple of these issues, as well as presenting our solution to terrible in-camera audio: wireless microphones. This is our list of the best wireless microphone out there. First, about this audio issues in-camera. Most video cameras (especially DSLRs) weren’t built to be good audio recordings. Manufacturers have been their time and attention into creating a device that captures great video, but not necessarily great sound. The sound quality may not be so high, volume may be weak, especially if your subject is not near the camera. And if you have unwanted background noise present, then all bets are off! Unless you are in a quiet environment, you will definitely be able to hear road noise in the background, animals noises or unwanted conversation getting picked up. Unwanted non-diegetic sound! Wireless microphones enable you to get a mic up close to the subject and record the audio that you actually intend on recording. Series II, 2.4GHz digital transmission with 128-bit encryption, up to 100 meters range. Digital 24-bit/48 kHz wireless operation for ultimate sound quality and dependable performance. Sennheiser is one of the premium brands when it comes to audio, delivering not only high quality output, as we have seen in their headphones and portable audio systems, but also with input as well. Their products are priced a bit more than many competitors, as well as other wireless systems, but is definitely worth the investment. If you’re serious about your investment in your video production gear, then Sennheiser is definitely the brand you want for high quality audio recording. This microphone is completely flexible and professional, easily portable and has the best sound quality that we have experienced with a wireless microphone. 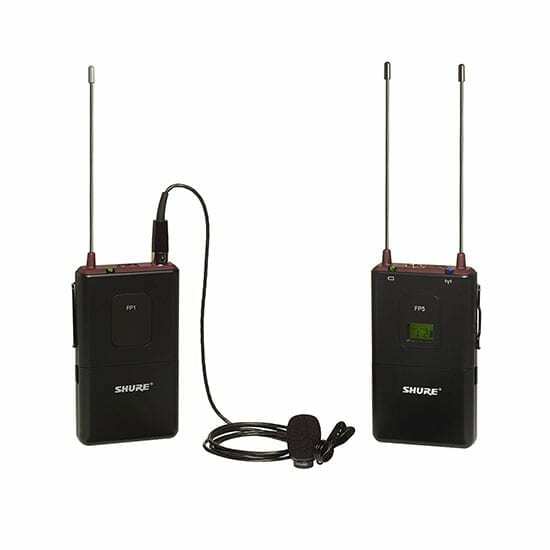 The clip-on is discrete and nearly invisible, and the receiver and transmitter is really easy to operate. Perfect for corporate / promo video work, as well as weddings and other events. This is our top pick! We’d be remiss not to include another Sennheiser microphone system here. Can you tell we’re Sennheiser fans yet? 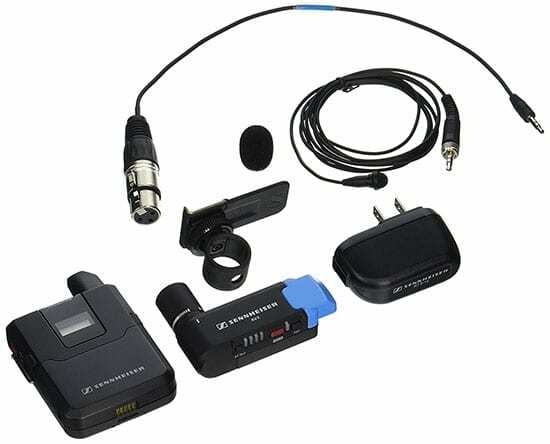 This Sennheiser comes in as another good system for audio capture in video production, and is different from the previous one mainly because it is camera mounted. 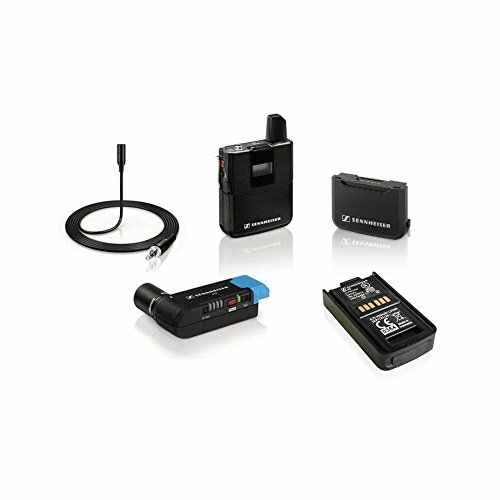 The Sennheiser AVX Digital Wireless Microphone System – ME2 Lavalier Set is a great option for a variety of video capture, from film and video production through to more vérité based production like news reporting and events. 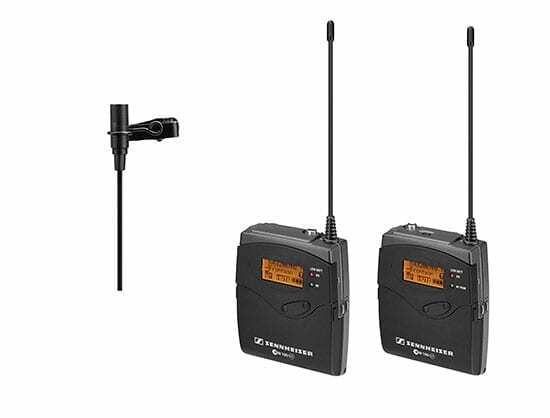 This metal-housed microphone set is also very discrete, and follows the actions of the camera using Phantom Power, so that you will not have to worry about manipulating the power on both camera and audio gear. The Rode brand is also very familiar with this audio business, especially for professional production purposes. It’s also one of the top brands I would suggest for a lot of audio purposes. Their DSLR Videomic became one of the biggest selling video production mics of all time and pretty much single-handedly revolutionized on-board camera sound. 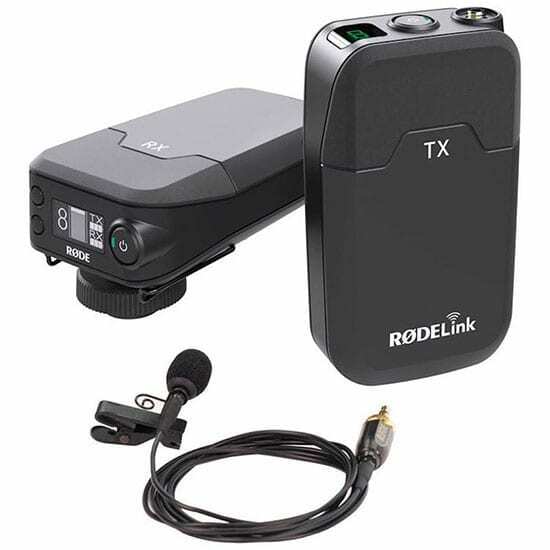 As far as the best wireless microphone goes, we present to you the Rode RodeLink FM Wireless Filmmaker System. Next on my list, is a gadget that can be mounted to your camera. 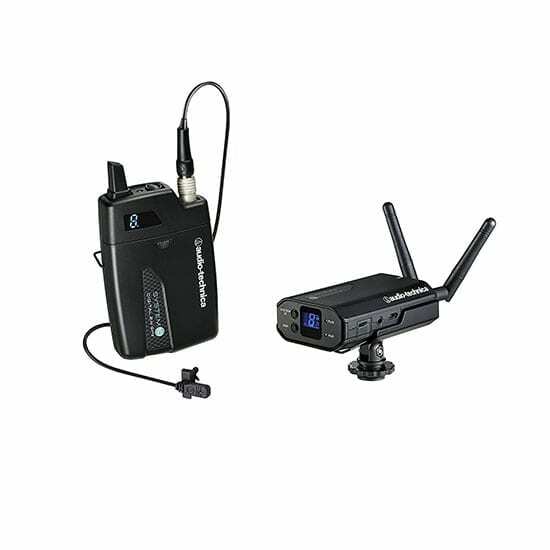 This is the Audio-Technica ATW-1701/L System 10-Camera-Mount Digital Wireless System that also comes with an Omni Lavalier Mic. While this piece of kit is not as well known known in the market as some of the others in this list of the best wireless mics, I quite like this audio device because it is discrete and small. One brand that always maintains a high reputation is Sony. Known around the world as a quality manufacturer of electronic goods for all sorts of industries, Sony is a great choice for video prodiction and filmmaking gear as well. It doesn’t disappoint with its products in the audio sphere either. 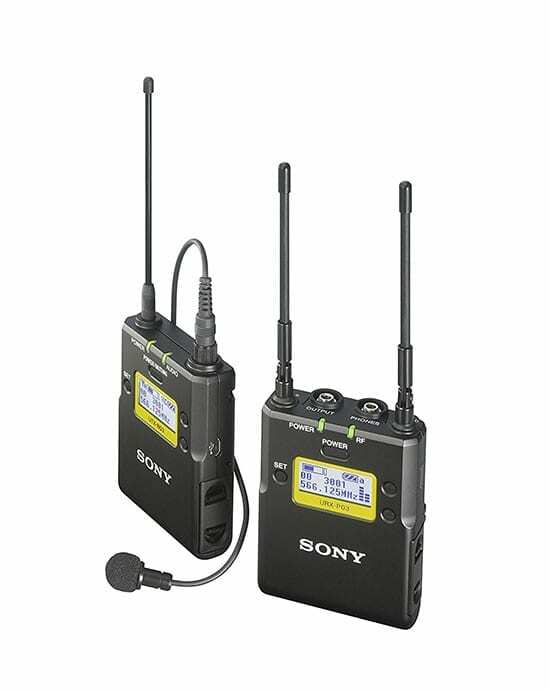 The Sony UWP-D11 Integrated Digital Wireless Bodypack Lavalier Microphone system is one of our top picks for this category of wireless microphone. It offers superior sound quality and can hold its own effectively against its competitors in areas like range, durability and ease of use. The Shure is an American brand that specializes in audio products, with a long history of supplying professional audio parts for both consumer and professional levels. So, it is no wonder that they also create solid filmmaking equipment. The Shure FP15/83 Combo Wireless System, H5 comes highly recommended by us. The FP wireless line has a very high approval rating from reviewers for its performance in audio capture with video production. This system is highly recommended when you are looking for a lot of flexibility and portability. There are ways to address these annoying sounds that you don’t want to have in the video. You may consider having recording audio in post-production. However, this can be really difficult and time-consuming. And, for film production and other acting scenarios, the performance is lost when it’s rehashed in a studio setting. It’s just not natural. There’s really no substitute for getting the audio right on the day! Another way, and this is definitely what I recommend, having directional mics, or uni-directional microphones that will be able to zone in to your actor (or subject’s) voice, have a clear sound input, and filter out the other noises that you don’t want to have. Typically, when working with actors and subjects, I would use a lavalier microphone (also more commonly known as a lav mic) and attach it to my actor discreetly. The great thing about lav mics is that they are very inconspicuous, and can easily be hidden, without sacrificing voice quality. They can come in both wired and wireless varieties, and my preference generally is the wireless kind. Lav mics really find their feet in the realms of event videography. Wedding videography, in particular, really benefits from miking up the groom to capture those all important vows during the ceremony. These are my 6 highly recommended wireless microphone systems. Not only are they superior audio capture systems, but they’re all easy to use and you’ll have minimal issues with handling them. They are a diverse set of wireless microphone systems, coming from a range of transmitter to receiver systems, some camera-mounted systems, others being able to have the extra feature of withstanding multiple weather conditions. They all have the sweet feature of blocking out unnecessary noise, and are definitely discrete enough that they can be hidden without an issue, and without sacrificing the quality of the sound that you are looking for. As I’m sure you’ll come to see, this sure beats recording audio in-camera, or having to record audio separately after editing the video. Each of these give out a much better option that simply relying on your video camera, or DSLR, to capture sound. Still, these aren’t perfect and if you’re not following good guidelines for recording quality audio, then you won’t get perfect sound. Following audio capture best practices is still your best bet. While these gadgets may take some investment, I would say that the cost of investing in at least one of these wireless audio systems will definitely give a good return on investment. As we’ve mentioned here before, in video production people will watch slightly subpar video quality (just look at some online video out there! ), but people will quickly click the off button if the sound is terrible! So, invest in your audio equipment, look after it, and it is sure to pay you dividends on your projects for many years to come. Oh my goodness! an incredible and informative article dude.